Join us at Switchyard Brewery to meet some Adoptable Furkids, check out some handmade items for sale for the dog and dog-lover, and have a pint or flight! Switchyard is donating $1 for every pint or flight sold during our time there! Petbucket.com – Huge savings on many pet products AND any new account will receive a 10% off when using this code PBK12183988 with their purchase. Plus, our rescue will also receive $10 credit to our account. Click on the icon below and happy shopping and savings! 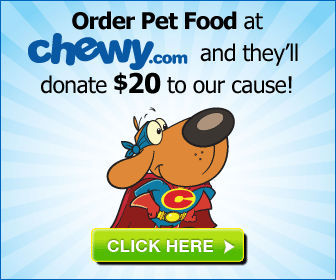 OLBH is now a rescue partner with Chewy.com which is where all of our supplies (food, treats, etc.) are purchased for our Forever Foster Program and our regular Foster homes. Great selection — Great prices — and delivered right to your door! Please use the link below and with your first purchase Chewy.com will donate $20 to the rescue! !